According to the National Institutes of Health, nearly 350,000 U.S. residents received dialysis in 2005. For patients with end-stage renal disease (ESRD), dialysis offers the only chance for survival other than transplant- a 78% chance for a year, 32% for five years, and 10% for ten years. Worldwide, 2002 figures estimated 1.2 million ESRD patients. Mr. Tighe Wilson, President of Wil-Med Global in Broken Arrow, OK, specializes in dialysis equipment, providing service and sales for Fresenius, Gambro, B-Braun, NxStage, and Baxter machines, the major manufacturers. Wil-Med deals with domestic and international customers. Wilson has twenty years experience in business and biomedical ventures and was drawn to dialysis as a niche market because of its growing necessity, as evidenced by the continuing rise in patient numbers. Wil-Med offers installation and on-site training for preventative maintenance to hospitals and end-stage renal community providers-the acute and chronic clinics. When hospital acquisitions or mergers occur, Wil-Med can supply equipment, support equipment and assist in liquidating a surplus. The clientele supply ensures Wil-Med acquires late model high end and wellmaintained machines. In Wilson’s observations, dialysis equipment has reached a plateau for the most part in terms of basic patient care. The most significant advancement in dialysis units is delivering therapy on an individual patient prescription basis. The machines can handle specific programming for patients’ therapeutic needs. Mr. Sudarshan Meenakshi, Director of Maple Consultants in Scarborough, Ontario, Canada, has 80% of his business in dialysis equipment, with the remainder in accessories and parts. Meenakshi has an electronics background specializing in biomed engineering and a Canadian post graduate diploma in Dialysis Technology. He is one of the few Certified Nephrology Technologists in Canada. Using this background, he educates and instructs, technologists, and tech assistants. Maple Consultants has a unique position in seeing the market from both a North American and Asian perspective. Meenakshi says that in Canada, using high-tech equipment in hospitals is a common practice. However in the Indian market, clients are looking for simpler dialysis units with competitive cost. If Maple supplies the units to a dealer, a basic preowned refurbished dialysis machine will be approximately $4,000. If the company is supplying to the end user, it provides two or three year warranty. In that case, the price will be higher around, $7000. The economy has had some effect on prices and costs, adding to the overhead that can raise expenses, the hike in oil prices for example, particularly affecting shipping costs. Wil-Med has a detailed reconditioning process utilizing the manuals for rebuilding pumps and hydraulics. Wil-Med’s techs examine the equipment mechanically and cosmetically with a checklist as they recondition. “It is important that when the user sees the equipment, it is clearly well-maintained, and functions well and looks right. A machine has to be ready to perform when it arrives at a medical center, and the down time kept to a minimum,” says Wilson. Wilson says the most important element is starting with well-maintained equipment. This means finding good sources from which to buy the units. If you are familiar with the sources, then you are familiar with those who are using the machines and how well they are maintained (i.e. optimally used and stored in a climate-controlled environment). A dealer should know the background of the supplier, and then institute a rigid test process with trained techs (Wil-Med has factory certified techs), and uses OEM parts. Dealing in obsolete equipment is not a good practice; the equipment should be currently supported by the OEMS. For Maple’s refurbishing requirements, the units should be clean and free of any external damage. Dialysis units are a combination of electrical/ mechanical parts and hydraulics. If the equipment has not been used for a few months the hydraulics compartment or the pumps tend to seize and crystallized parts can stick tubes and valves. The machines should not be stored for a long time, and they should be rinsed and disinfected regularly to avoid any bacterial growth. “In developing expertise in reconditioning, it’s all about knowing the model and manufacturer, getting to know the machine and being able to pass along the quirks of the machines to the domestic and international customers,” Wilson says. If those customers come in for questions and answers, Wil-Med can help them to learn more about the mechanical issues and operational aspects and offer an update on the additional features and the subtleties of a unit. Because scheduled preventative maintenance is so important, Wil-Med will also provide recommendations for good techs in the end-user’s area. Dialysis providers, like other medical centers, have to deal with budgetary cuts and the rising costs in medications and overhead and labor. A good dealer takes the budget needs into account when working with a client. Wil-Med takes a close look at a facility’s programs to see how to stretch the dollar. One particular question in debate recently is the reuse of dialyzers. From Wilson’s standpoint, the choice is unique for each clinic. For a clinic with a tight budget, reuse can save four to six dollars per treatment, allowing more budgeting for staff, dieticians and other care that improves the quality of life for patients. Wil-Med works with medical facilities to determine if reuse may be an option. Meenakshi says. “However, knowledge of local issues, being fluent in the vernacular plus the commitment and dedication of meeting the clients’ requirements are factors that can improve growth of the industry.” Meenakshi says, “When the unit reaches Maple’s warehouse in Chennai, we carry out preventive maintenance and other quality control measures to meet Indian standards.” Maple has a fully-equipped technical lab in Chennai. Maple’s clients in India are local dealers and nephrologists who have their own hospitals and nursing homes. Meenakshi and his business partner Mukesh Gajaria use their extensive experience and technical know-how to assist any customers who require clinical information. The service for Indian customers ensures that the area is getting better equipment, with quciker delivery. Another view of the international dialysis market comes from Rajagopal Geethu of Zigma Meditech India Private Limited, also located in Chennai, India. Zigma has just entered the dialysis market, and currently provides about 2% of total business. “Over a period of time we felt that we were missing out on an opportunity in the market and hence have started supplying units to our customers,” says Geethu. Zigma sells refurbished Fresenius units primarily to hospitals and specialty dialysis centers in the South India market. The refurbished units sell for around $3000 – $4000. Geethu says the units should last a minimum of five years, if not more. In the refurbishment process for Zigma, the physical components of the unit are examined. Then the condition of the tubing and connectors is checked. A good deal of preventative maintenance is performed. The unit also undergoes a complete cleaning, followed by testing to ensure that there is no residue in the system. Special attention is given to the springs and seals, as they have constant interaction with acidic fluids. The most common problems are tubes and seals breaking or the pumps malfunctioning, in addition to any electronic/electrical failure that may occur due to voltage fluctuation. When Geethu consults with clientele for the best solution, the customers look at reducing the overall cost of ownership of the equipment. “As long as the equipment does not compromise even a very small percentage in delivering as it is supposed to, they are ready to take used or refurbished machines without the slightest hesitation,” he says. In India, the savings amount to about half the cost of the new equipment. The cost of maintenance is also lower. NxStage of Lawrence, MA, manufactures a home dialysis unit, the System One. NxStage also has a critical care division selling to hospitals, with seven out of the top ten kidney care and teaching institutions in the U.S., including UCLA and Johns Hopkins. Mr. Joe Turk, Senior Vice President, Commercial Operations of NxStage, says that in 2005 the use of home dialysis was well under a half-percent of dialysis-user population, continuing a decades-long trend. 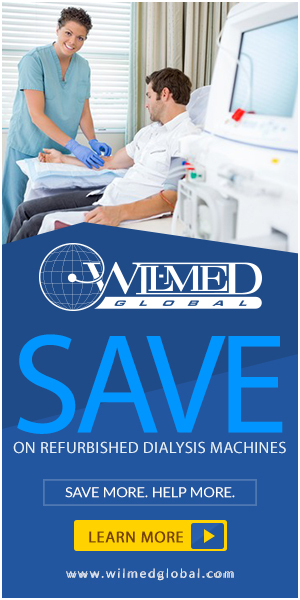 However, in the last couple years, home dialysis has begun to revive as an industry. During that time, NxStage has doubled patient numbers. Yet the numbers are still fairly small, around one percent of the total dialysis population. NxStage has also created a unique online registry with information about the patients who use NxStage’s home dialysis. Advisors to NxStage felt that the company had the opportunity to provide a needed service in collecting demographic information. NxStage took up the challenge. “We have been diligent about capturing information in a registry format concerning treatment and mortality,” Turk says. As an example, the data from the registry shows that men slightly outnumber women in using NxStage home dialysis, and the average age of a NxStage user is 52. On a very positive note, the mortality rates have turned out to be 50% lower than expected. Turk says the System One is popular with its users due to the emphasis on compact design and ease of use for the home patient, including a simple interface. The System One is designed to be infrastructure independent; it can be plugged into any grounded outlet. There does not need to be adjustments for changes in electricity or water. The device is small and can be checked for air travel. “The device frees the patient in a number of different ways. The patient having home dialysis does not have to have life centered around appointments with the dialysis center, having to plan trips around treatment,” Turk says.